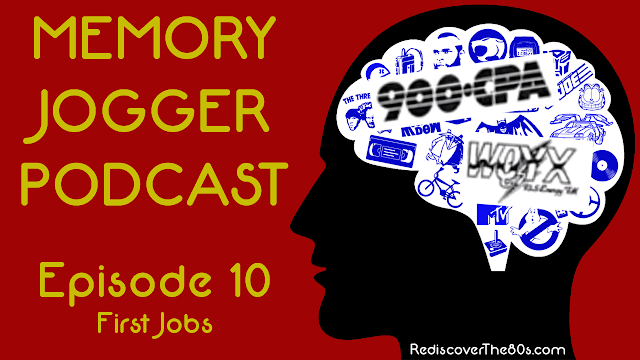 Episode 10 of Memory Jogger is all about Jason and Wyatt's memories of our first paying jobs. We remember cleaning up the cafeteria at school, a summer with the local township crew, running a gas station/car wash, and a time when we worked together at the local radio station WCPA/WQYX in Clearfield, PA.
As a special treat, Wyatt invites our old boss at the radio station Bob E. Day to join the podcast and reminisce about our time working there! Other than having a phone-in guest, Wyatt also rigs up a way to play old jingles and liners from the radio station that he managed to save. Plus, he also takes us through a 3-D layout of the station! You won't want to miss our recording session on YouTube embedded below. You can also find the Memory Jogger Podcast as part of the Rediscover the 80s Podcast feed. Search for it in your favorite podcast app like iTunes, Google Play, TuneIn, and Stitcher or on the Throwback Network podcast feed.